While I am not selling Real Estate in Idaho Falls with The Group Real Estate, I am selling Real Estate with Copper Creek Homes. I like to call it all things Real Estate. I am Brad Camphouse, The Bearded Realtor, your Snake River Valley Real Estate specialist. I really like my new position at Copper Creek however because I come from a construction background. I began my construction experience at a very young age. At 9 years old my dad would take me to the construction site. He started out by giving me a broom and teaching me how to work. That broom later turned into a tool bag. I began acquiring tools an old used finish hammer with a cracked handle, then I found an old tape measure. Fast forward 9 years and the summer of my 18th birthday and I was already a finish carpenter and labor foremen in charge of all of the carpenters and labors at an apartment complex that we were building. My dad has always been in construction and is one of the top project managers in the Nation today. The company he works for literally does billions of dollars in construction all over the world. I am very proud to say that he was my teacher when it comes to construction. I was recently on the Discovery Channel because of my ability to construct a structure out of nothing more than what nature had provided at and around our build site, the aspen grove. I had two others with me and we had a combined total of three tools. A bush craft knife, a hatchet and a bow saw. If you are interested in those types of things the show is called Bush Craft Build Off Season 1 Episode 1. I am now also a Realtor which combined with my background in construction, makes me quite valuable when selling homes that are new construction. From planning and digging the hole in the dirt to laying carpet and setting the move in date, I will walk you through every step. This blog is going to be the start of what those steps are as well as what happens through each one. This however is just the beginning. Now when I say from planning to move in people tend to only thing about the paperwork and not the actual work. That is why I add to that statement from digging the hole to laying carpet because that is the actual work. The very first step is planning. We have to know what it is you are after in a home before we can just build it. Now that being said we can just build a house but that is what we consider a spec home. Which I then list and try to find a buyer to fit the home. Here at Copper Creek we build a home to fit the buyer. Once we find the right plan then we go and find the dirt to match your plan. Once we find the dirt we can begin. We then figure out where the home will sit on the lot, we do this with stakes and string line, laying out the footprint of the home. Next comes the excavation and they dig a hole for the footings of the foundation, then the foundation walls. On top of that we build a sub floor. Then walls go up, followed by a second floor or a roof. Once framed, in come the inner workings of the house. Plumbing, electrical and HVAC “Heating Ventilation Air Conditioning.” They will all have to come back once the insulation, drywall, tape, texture and paint are done. These are the things happening on the inside, meanwhile things on the outside are also happening. Shingles on the roof, siding on the house. Back on the inside the trim, carpet, tile along with cabinets. Counter tops go in we do some touch up and a punch list then we close the loan and the new home owners move in. This is an incredibly condensed list but it is just to give an idea of the steps in building a home. 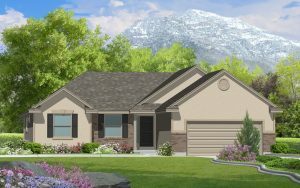 There are a few things that Copper Creek Homes do that most other builders are not doing in Idaho Falls that set them apart. One of the main things is a two by six wall that is built with two by four studs that are staggered on twelve-inch centers. This is bringing some commercial building aspects into the realm of residential. These walls must be engineered but it causes a much sturdier wall. The main reason for this is not for the strength but for the energy savings that you achieve with it. By staggering the studs, it creates a two-inch gap that allows for insulation to be continuous through the wall. Most builders don’t think of this but wood is a very good conductor of heat. Having studs that touch both sides of the wall allows for heat to transfer from both inside out during the winter and outside in during the summer. Studs have an R value of three, which is terrible. This is the case with a standard two by four wall. Two by six staggered stud walls have a much better R value which is whatever insulation you use. When I was telling my dad about this he loved the idea. Then he started to tell me that when he built my childhood home in the early 90s he did not think of doing a two by six staggered stud wall he did think about how the wood transfers heat. Come to find out he wrapped our entire home with two inches of foam insulation before he put a layer of brick around the whole house. He is one of the top builders in the Nation because he thinks. He has taught me so much and I realize that some of his old sayings are very true. One of them was “son I have forgotten more than you currently know.” I hope one day I will know what he has forgotten. The second that I love is “measure twice cut once.” When we made a mistake on the TV show this summer I kept saying that and didn’t even realize until I watched the show how much I am like my old man. But at the same time, I have very much put my own spin on things. Love ya DAD!